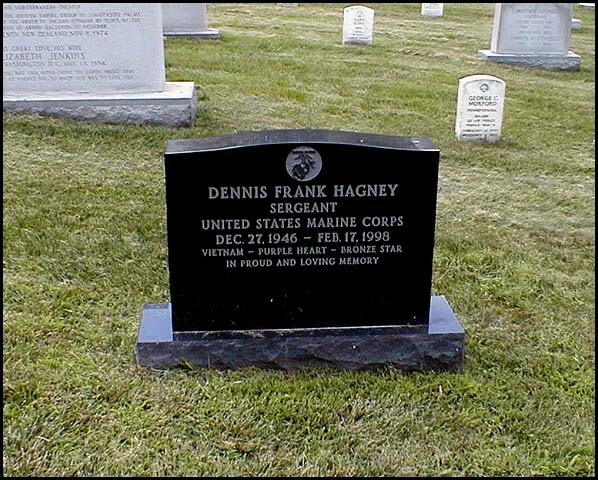 Dennis Frank Hagney, 51, a former Falls Church, Virginia, resident who had been a service agent with Delta Airlines for more than 25 years, died of cardiac arrest February 17, 1998at a hospital in Sarasota, Florida. Mr. Hagney, who lived in the Washington area from about 1970 to 1990, was born in Boston and attended Louisiana State University at New Orleans. He served two tours with the Marine Corps in Vietnam and received the Bronze Star Medal with combat "V" and the Purple Heart. He worked for Delta in Washington before transferring to Sarasota. Survivors include his wife, Diane E., of Sarasota; two sons, Frank J., of Richmond, and Louis W., ; and four sisters, Maureen Hove, Patricia Boros, Gail Harrison, and Karen Gardner. He was buried on February 26, 1998 with full military honors in Section 7 of Arlington National Cemetery, near the Tomb of the Unknowns and the Memorial Amphitheater.